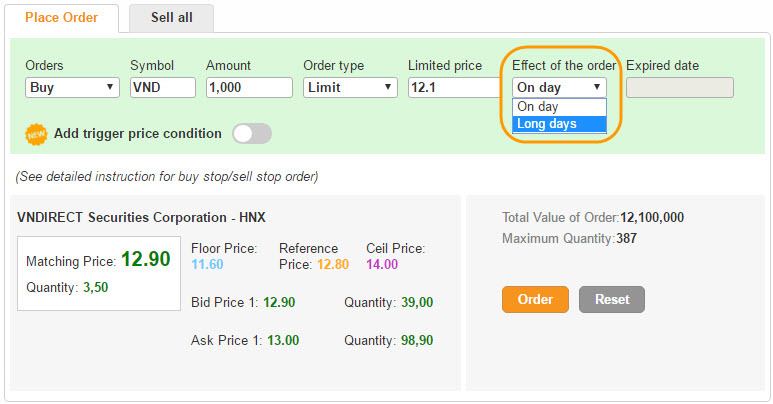 Allowing client to maintain buy/sell order on many days at target price. 1 Fill in the blanks with order information, select “ Effect of the order”: Long days. 2 Select the Expired date. Good till date order only apply for Limit price. The expired date is the date when client’s inactive order has expired. The good till date order is valid for a maximum of 30 days since placing order. 3 Click the Place Order button to complete. The Good till date order is pushed immediately into the system during trading time if satisfying trading conditions. The partially filled GTD order will be ended when the quantity is fully matched or at its expiry date or client cancels the order. 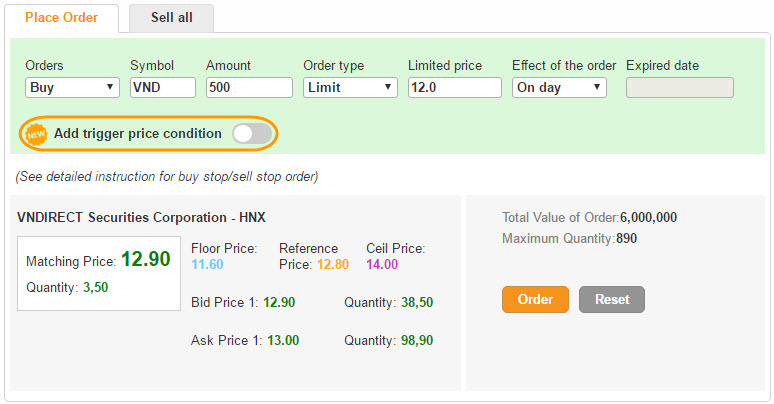 Client can cancel or edit the order information (Price, quantity) at the Order Book. If the GTD order satisfies the pricing condition, but your purchasing power is not enough, VNDIRECT will promptly notify client about additional purchasing power via SMS. 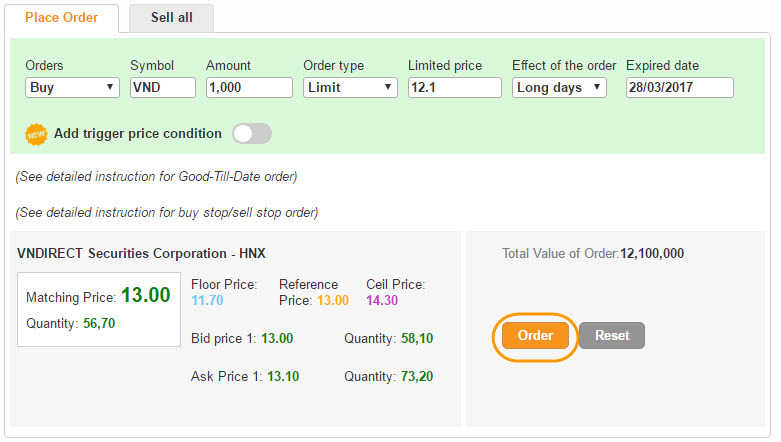 A conditional order allows client to place a buy/ sell order at target price when the stock price reaches predefined target. This type of order helps client to minimize the risks and seize opportunities before the unexpected volatility of the market. 1 In the Place Order tab, fill in the blank with information of the order and select Add Condition. 2 Select conditions about the trigger price. Click the Place Order button to complete the conditional order. Conditional order is only applicable for Limit price..
- The expired date is the date when client’s inactive order has expired. 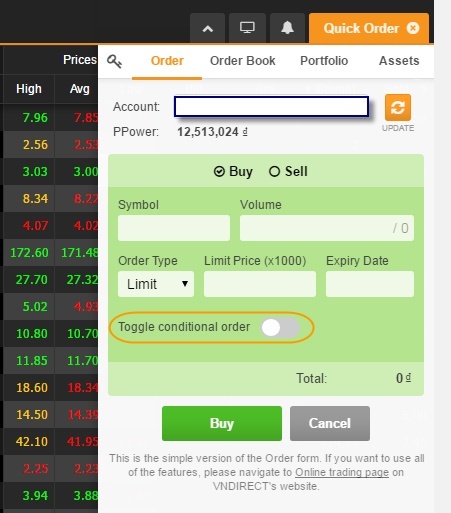 The inactivate condition order is valid for a maximum of 30 days since placing order..
- When triggered (whether the order is matched or not, or rejected), it will automatically expire at the end of the session and will not be reactivated. 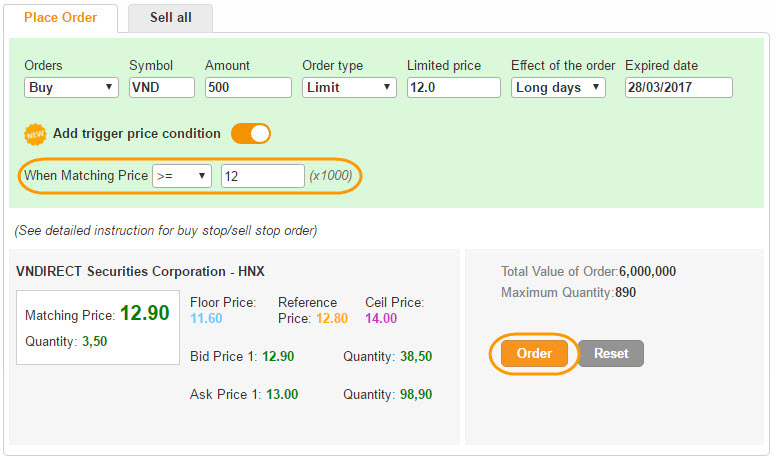 3 Select the Conditional Order Book and track the status of the new conditional order. 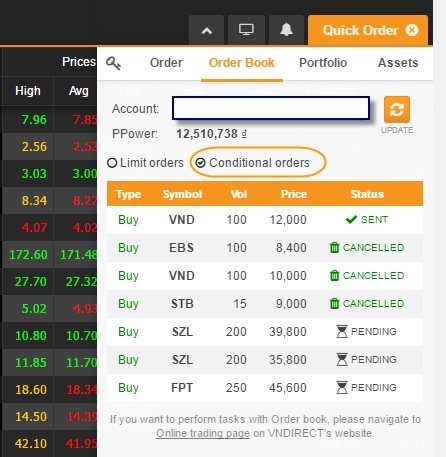 For example: At the end of 15th October 2016, the following orders were pending; the closing price of VND was 14000. 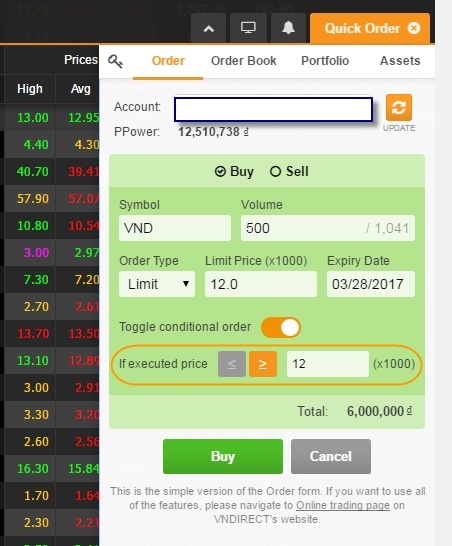 On 16/10/2016, when the matching price of VND was 14600: The first order was activated. On 17/10/2016, when the matching price of VND was 15200: The first order was invalid, the 3rd order satisfied trigger condition so it should be activated. 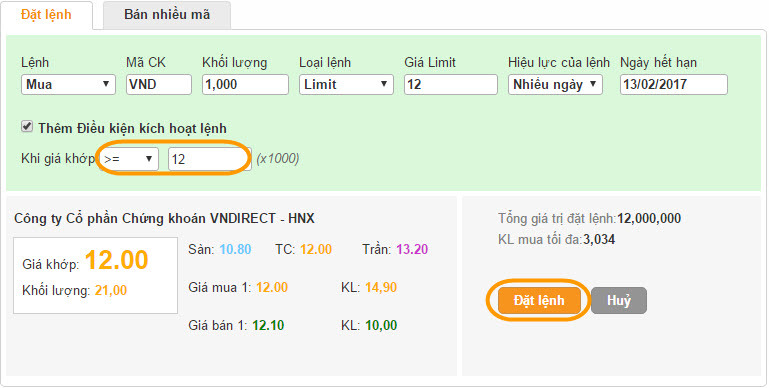 On 18/10/2016, when the matching price of VND was 14500: The second order expired due to the expired date was 17/10; the first and the third order were activated on previous day, so it was invalid.